Per 1 Slice Serving: 70 calories; 0 g sat fat (0% DV); 150 mg sodium (7% DV); 1 g sugars. Special recipe bread. No seeds. Family bakers since 1925. Bake shop. Since 1925, the Lewis family has dedicated themselves to baking delicious and nutritious bakery products. Lewis Bakeries is an honest, hard-working, family-owned company that is devoted to producing high quality products. Our aim has always been two-fold: respond to consumers' needs, and produce the very best bakery foods. Low fat. No trans fat. Saturated fat free. Cholesterol free. Excellent source of thiamin (vitamin B1). Good source of riboflavin (vitamin B2). Excellent source of niacin (vitamin B3). Excellent source of folate (vitamin B9). No high fructose corn syrup. 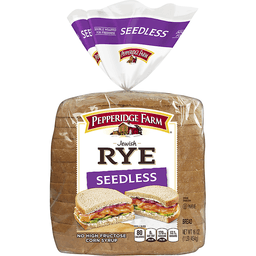 Per 1 Slice Serving: 70 calories; 0 g sat fat (0% DV); 150 mg sodium (7% DV); 1 g sugars. 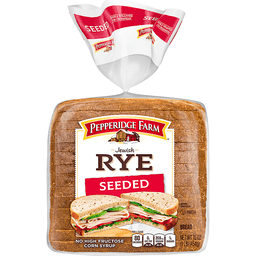 Made with caraway seeds. Special recipe bread. Family bakers since 1925. Bake shop. 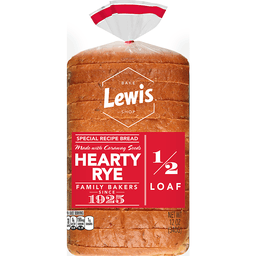 Since 1925, the Lewis family has dedicated themselves to baking delicious and nutritious bakery products. Lewis Bakeries is an honest, hard-working, family-owned company that is devoted to producing high quality products. Our aim has always been two-fold: respond to consumers' needs, and produce the very best bakery foods. Low fat. No trans fat. Saturated fat free. Cholesterol free. Excellent source of thiamin (vitamin B1). Good source of riboflavin (vitamin B2). Excellent source of niacin (vitamin B3). Excellent source of folate (vitamin B9). No high fructose corn syrup. No high fructose corn syrup. 80 calories per serving. 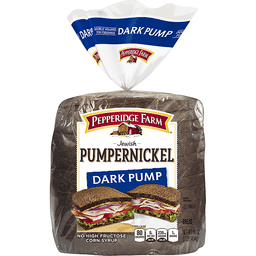 Per 1 Slice: 80 calories; 0 g sat fat (0% DV); 220 mg sodium (10% DV); 1 g sugars. We are committed to providing you with quality products and welcome your questions and comments. Call 1-800-984-0989, Consumer Relations Department. When writing, please include the proof-of-purchase (bar code) and stamped date code. Take Home Some Deli Flavor! 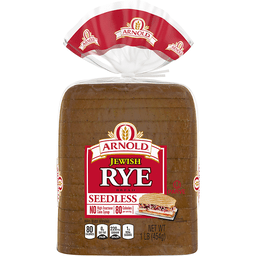 Nearly, flavorful and delicious, with a firm texture that makes it perfect for any sandwich or spread, Arnold Real Jewish Rye is made from a special combination of rye sour and rye flour. 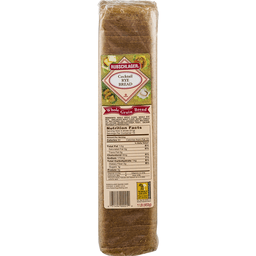 With caraway seeds or seedless, it's got the deli-licious flavor you can't do without! 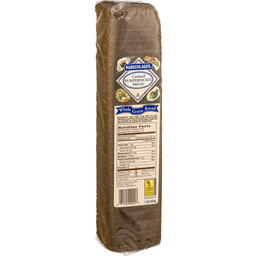 www.armoldbread.com.